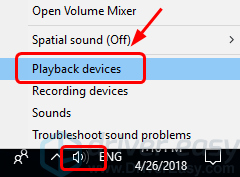 Having trouble hearing from your computer speakers? Not knowing what just happened when you lost sound? Worry no more, you’ve come to the right place. Here in this article, we’ll show you how you can fix your not working computer speakers in no time. Here are 5 fixes for you to try. You might not need to try them all; just work your way down and find the one works for you. you accidentally turn on the mute mode on your laptop. The screen shots below are taken in Windows 10, but all fixes apply to Windows 7 as well. 1) Right-click the sound icon at the bottom right of your desktop, and click Playback devices. 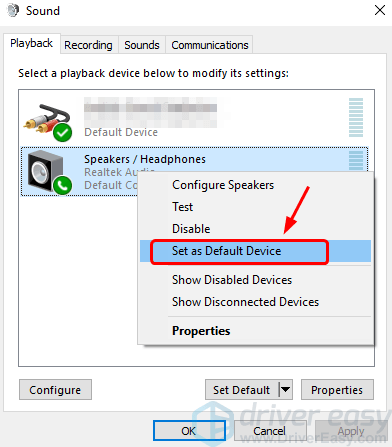 2) See if your speaker are set as the Default Device. You’ll usually see a green tick button next to the default device. 3) If your speakers are not set as the Default Device, right-click the name of your speakers, and click Set as Default Device. 4) Restart your computer, and see if your computer speakers are working again. If not, you may need to try the fixes below. 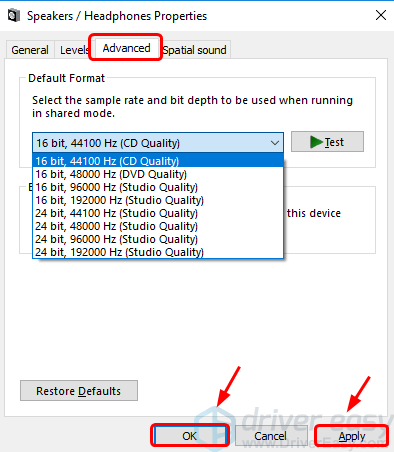 If changing the audio setting doesn’t fix your not working computer speakers, it’s very likely that your audio or sound card driver is to blame: it’s either broken, or you have a wrong driver installed, and you should try to update your sound card driver to get them working again. If you’re using USB speakers, you should also consider updating your USB port driver, since they could also be the culprit. 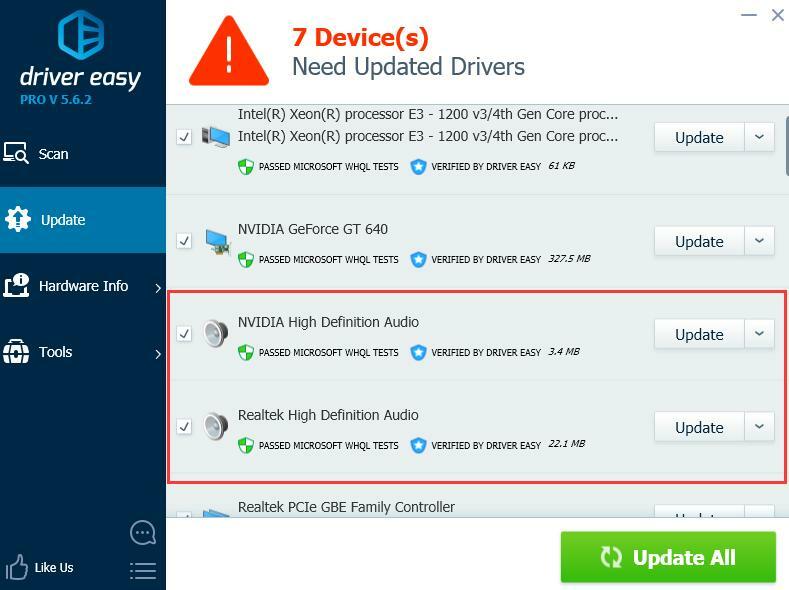 There are two ways you can get the right drivers for your audio card and USB port: manually or automatically. 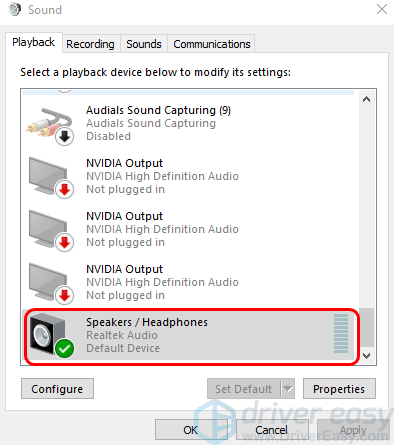 Manual driver update – You can update your sound and USB port drivers manually by going to the manufacturer’s website for both your sound card and your computer, and searching for the most recent correct driver for each. 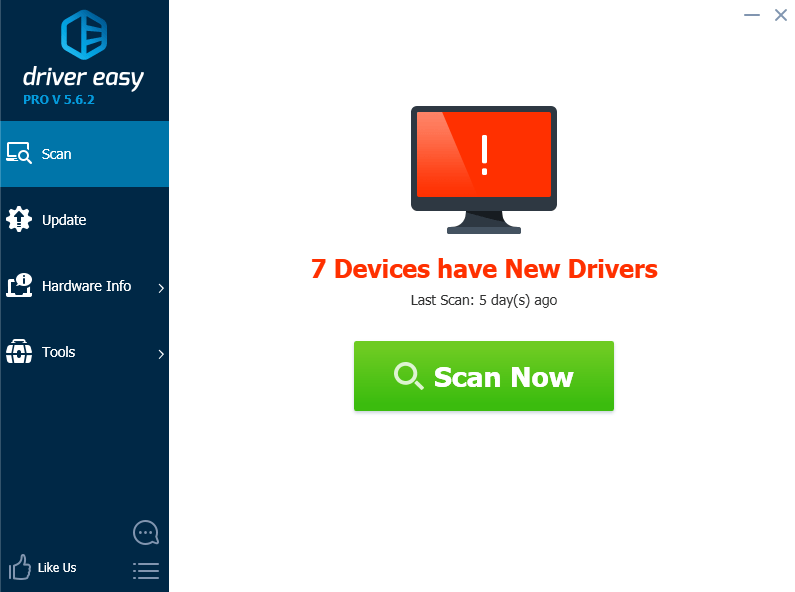 Be sure to choose only drivers that are compatible with your variant of Windows. 3) Click the Update button next to the flagged sound driver and/or USB driver to automatically download and install the correct version of that driver (you can do this with the FREE version). 4) Restart your computer when the sound card driver and the USB port driver finish installing. See if your computer speakers are working properly now. 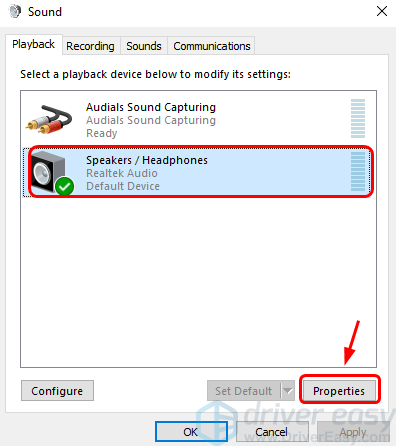 2) Make sure your speakers are set as the Default Device, then select it and Properties. 3) Go to the Advanced tab. Select from the drop-down menu the format you’d like to try. You may need to try them one by one to find the one works for your system. When you’re done selecting, click Apply and OK to save the change. 4) See if you can hear from your computer speakers now. The sound enhancement feature might not be available in some computers. If you don’t see such setting on your PC, just move on to next fixes. 3) Go to the Enhancements tab. 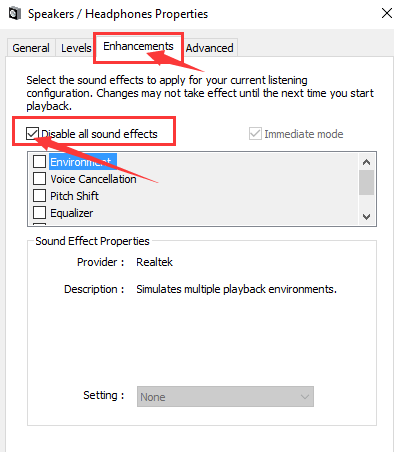 Tick the box for Disable all sound effects. Click OK to save the change. 4) Check to see if your computer speakers are working now. 1) On your keyboard, press the Windows key and S at the same time, type cmd. 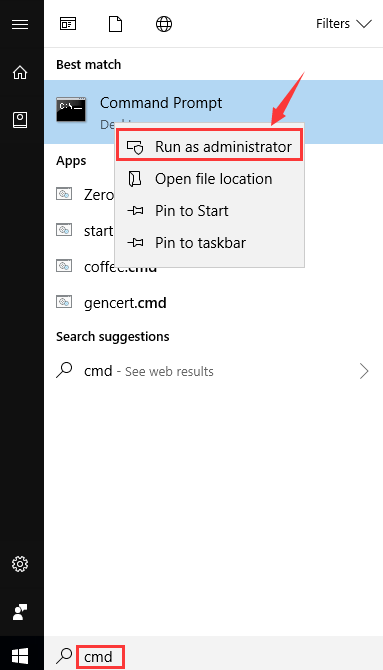 Right-click Command Prompt and click Run as administrator. 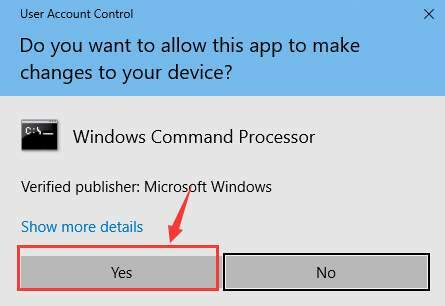 When prompted with the UAC, click Yes to continue. 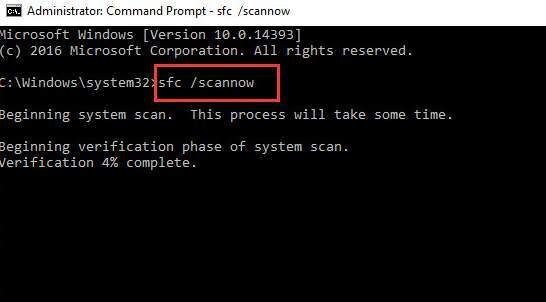 2) In the Command Prompt window, type in the following command. Make sure that you have made no typo and press Enter on your keyboard. 3) Leave the Command Prompt window on until the command completes. 4) When the check is done, restart your computer as instructed. See if your computer speakers are working again.